Transient Designer, Software transient shaper from SPL in the Transient Designer series. 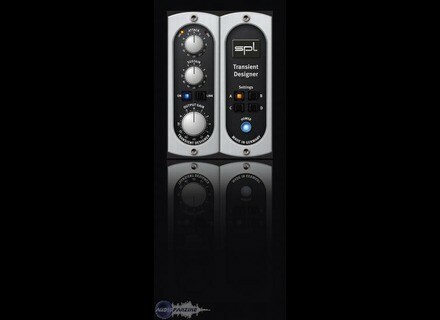 The Deal of the Month at Plugin Alliance gives you the opportunity to save $100 on the SPL Transient Designer plug-in. In september, the SPL Transient Designer is available for purchase for $99 instead of $199 at plugin-alliance.com. The discount applies automatically, you won't need to enter any promotion code. Plus, the offer can be combined to the Dynamic Discounts applied if you purchase two plug-ins and more at Plugin Alliance. ChordPolyPad plays chords on your iDevice Laurent Colson released on the AppStore a new iOS app that allows for creating, saving and MIDI playing chords. Zynaptiq Unfilter Review As its name implies, the purpose of Unfilter, the new product of Zynaptiq, is to eliminate all filter effects applied to an audio file. How and does it really succeed? Allen & Heath unveils the ICE-16D audio interface Allen & Heath expands its ICE-16 multichannel audio interface with balanced I/O on D-Sub connectors with the ICE-16D.